parachute release gear consists of a metal ring that attaches the parachute to the mine during air travel. It is released from the mine upon water impact by inertia weights, wipe-off plates, or hydrostatic mechanisms. The control device opens the parachute during the mine's descent. An adjustable fixed-delay device usually controls it. Since firing an explosive fitting deploys the parachute, parachute pack control devices contain explosive components. REVIEW NUMBER 3 Q1. What element of a mine carries all other components? Q2. List the explosive components of a mine. Q3. What amount of explosives is used in air-laid mines? Q4. After a mine is planted, what device prevents the mine from firing until it has been submerged for a predetermined time? Q5. What is the range of the delay time in planted air-laid mines? Q6. List the influence-actuated firing mechanisms. Q7. What type of mine is detonated by the sound waves generated by nearby ships' rotating screws? Q8. What force actuates the pressure mine? Q9. What actuates the magnetic type of mine? OPERATIONAL AIRCRAFT MINES Air-laid mines currently in operational use are discussed briefly in the following paragraphs. Mk 55 Mine The Mk 55 service mine and the Mk 55 exercise mine (fig. 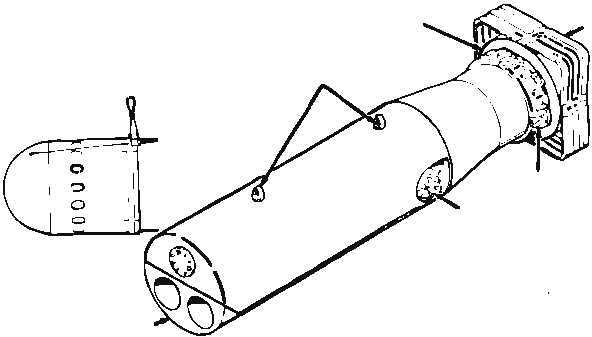 5-11) are air-laid bottom mines. Each mine is fitted with a nose fairing and box fins for drop stability. Each is suspended from the aircraft by two suspension lugs spaced 30 inches apart. Both mines use a parapak designed to slow descent and reduce impact when the mine enters the water. A control unit, activated by a single arming wire, opens the parapak. Each mine is equipped with an arming device and a double arming wire used on the extender and hydrostatic switch. The Mk 55 mine is equipped with a firing system that is responsive, either singly or in combination, to the acoustic, magnetic, and/or pressure influence of a 5-11 WEIGHT: FAIRED: UNFAIRED: 2273 LB. 2132 LB. LENGTH: FAIRED: UNFAIRED: DIAMETER: SUSPENSION PROVISIONS: 114.6 IN. 90 IN. 23.6 IN. 30 IN. SUSPENSION LUGS PARAPAK (TYPICAL) FIN (TYPICAL) RELEASE MECHANISM ARMING DEVICE MK 20 FAIRING NOSE FAIRING A0f05011 Figure 5-11.Mk 55 service and Mk 55 exercise mine.